There must be the will to produce a superior thing. IS QUALITY REALLY AN OPTION? You know there are lots of challenges these days, and they change at a moment’s notice. HIPAA. Interoperability mandates. Data privacy policies. Obamacare. Retail hacking. Privacy theft. Credit card theft. Data security breaches can mean not only dissatisfied customers, but also heavy fines and even licensing consequences. You don’t want to mess around here. There are all kinds of Quality Assurance services. 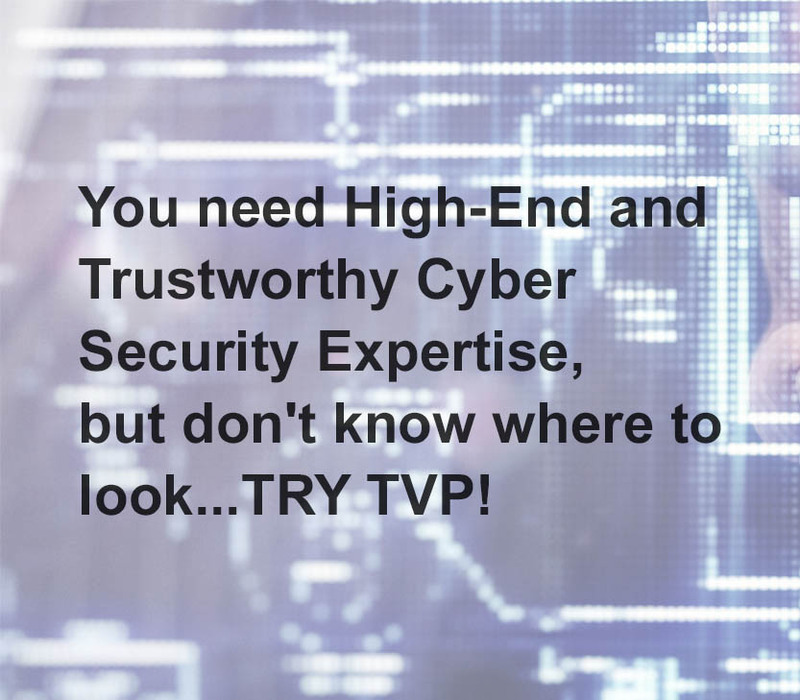 You want the kind that really protects your interests — your functionality… your efficient business processes…your domains and tools… your customer satisfaction… your uptime… your profitability. 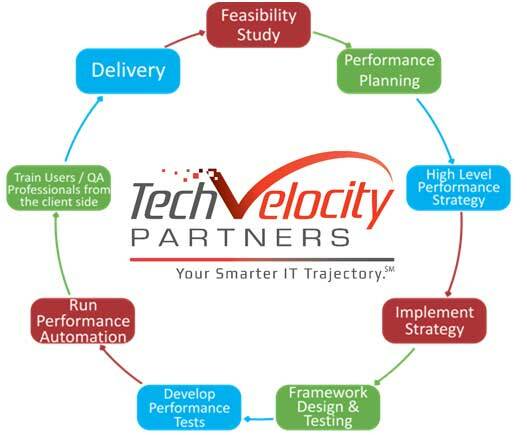 TechVelocity Partners is built on quality, from the ground up. Our parent company specialized in sophisticated QA. Now our Gen3 QA is spot on. 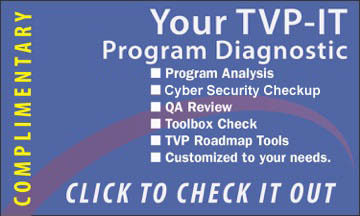 TVP’s QA division stands apart — literally! We make sure we operate independently of our other business units, so you can rest assured we’re not playing CYA games. Like somewhat-friendly “war games,” we try to find the other team’s weaknesses as we challenge any and all options we can think of to ensure Q. We make smart recommendations from the get-go, and test all processes rigorously. We’re the kind of people who find those mistakes in those old “What’s Wrong With This Picture?” illustrations. Because when we find it, and fix it before you go live, we make your business operations run efficiently. Run profitably. And make everybody on your team look like heroes. Why not choose a partner co-founded by a Mayo-trained, respected private practice physician and a successful IT entrepreneur? We’ve got a unique combination of healthcare expertise…and top of the line knowledge and innovation in technology, Leading to ideal network protection. Just as a wise physician knows which tests to order for their patients, we will know what types of tests needs to be done to make you healthcare systems healthy. And you’ll be pleased to know that TVP’s president is a respected Mayo-trained physician and business entrepreneur who helps guide our thinking. BROKER PORTAL SYSTEM — We have extensive experience testing healthcare apps and systems using test automation tools, such as Selenium and Rational Robot, as well as manual testing tools such HP Quality Center and other open source tools. We also carry out performance testing, security testing, and multi-platform testing and load testing for applications in the healthcare industry. CONFORMANCE TESTING - Testing conformance of security and frameworks requirements, such as HIPAA, VA, FDA, etc. PERFORMANCE AND LOAD TESTING - protecting healthcare apps against performance and load benchmarks. We can help you leverage cloud platforms such as Amazon EC2 and other cloud platforms. Platform Testing - for mobile platforms testing such as Windows, iOS, or Android for "cross browser compatibility". We have proven record in designing & developing Automation Testing frameworks especially in the open source technologies such as Behave, Selenium, Appium, Cucumber, and Fitnesse. A number of clients have partnered with us to assist with their mobile automation, mobile testing, security and performance testing efforts using technologies such as: QTP, QC, LoadRunner, JMeter, Neoload, GreenHat and Open Source Tools like Selenium RC & Webdriver with Java, .Net, Python, Ruby, PHP, JMeter, SoapUI, TestNG, Jenkins, ReportNG, JUnit, Cucumber & Capybara, Tosca, Perfecto and OWASP Security tools. Don't put your healthcare system and applications at risk. Let us handle your healthcare manual and automated testing to give you defined results with optimal efficiency and convenience. DON’T MESS UP YOUR PERFORMANCE. Our teams determine the system parameters in terms of responsiveness and stability under various workloads and measure the quality attributes of the system such as scalability, reliability and resource usage. Performance testing is the process of determining the speed or effectiveness of a computer, network, software program or device. This process can involve quantitative tests done in a lab, such as measuring the response time or the number of MIPS (millions of instructions per second) at which a system functions. 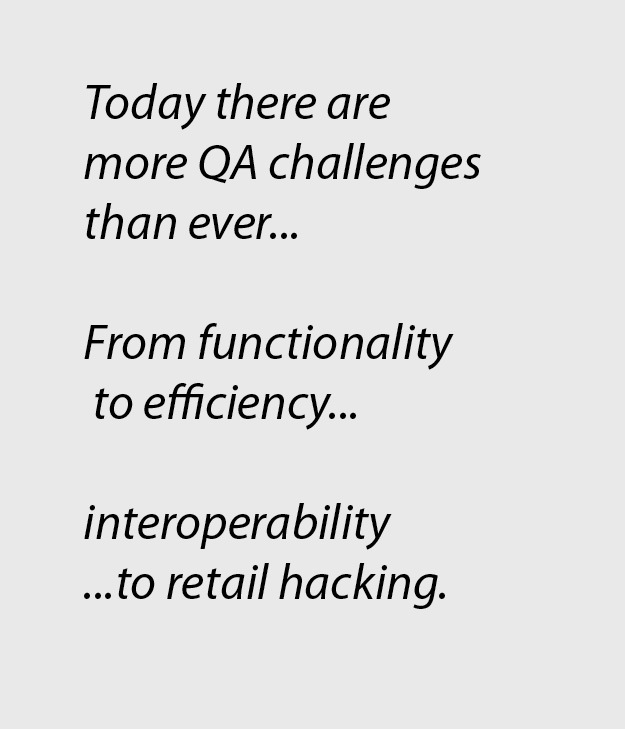 Qualitative attributes such as reliability, scalability and interoperability may also be evaluated. Performance testing is often done in conjunction with stress testing. Performance testing can verify that a system meets the specifications claimed by its manufacturer or vendor. The process can compare two or more devices or programs in terms of parameters such as speed, data transfer rate, bandwidth, throughput, efficiency or reliability. Load testing is a type of performance test where the application is tested for its performance on normal and peak usage. Performance of an application is checked with respect to its response to the user request, its ability to respond consistently within accepted tolerance on different user loads. How application behaves in case of expected maximum load? Whether Database is able to handle the maximum expected data load? Are there any network related issues to be addressed? Stress testing tries to break the system. That’s a good thing. The test also gives the idea for the maximum load the system can hold. Generally Stress testing has incremental approach where the load is increased gradually. The test is started with good load for which application has been already tested. Then slowly more load is added to stress the system and the point when we start seeing servers not responding to the requests is considered as a break point. During this test all the functionality of the application are tested under heavy load and on back-end these functionality might be running complex queries, handling data, etc. What is the max load a system can sustain before it breaks down? How is the system break down? Is the system able to recover once it’s crashed? In how many ways system can break and which are the weak node while handling the unexpected load? Volume test is to verify the performance of the application is not affected by volume of data that is being handled by the application. Hence to execute Volume Test generally huge volume of data is entered into the database. This test can be incremental or steady test. In the incremental test volume of data is increased gradually. Generally with the application usage, the database size grows and it is necessary to test the application against heavy Database. A good example of this could be a website of a new school or college having small data to store initially but after 5-10 years the data stores in database of website is much more. The most common recommendation of this test is tuning of DB queries which access the Database for data. In some cases the response of DB queries is high for big database, so it needs to be rewritten in a different way or index, joints etc. need to be included. Is the application capable of meeting business volume under both normal and peak load conditions? Will the application able to support the future load? Is the environment capable to stand for upcoming increased load? What are the additional resources required to make environment capable enough? Capacity testing is used to determine how many users and/or transactions a given web application will support and still meet performance. During this testing resources such as processor capacity, network bandwidth, memory usage, disk capacity, etc. are considered and altered to meet the goal. Online Banking is a perfect example of where capacity testing could play a major part. Reliability Testing or Recovery Testing verifies whether the application is able to return back to its normal state or not after a failure or abnormal behavior, and also how long it takes to do so. An example — an online trading site experiences a failure where the users are not able to buy/sell shares at a certain point of the day (peak hours) — but are able to do so after an hour or two. In this case, we can say the application is reliable or recovered from the abnormal behavior. How is the new version of the application performing when compared to previous ones? Is any performance degradation observed in any area in the new version? What should be the next area where developers should focus to address performance issues in the new version of application? Whether the application will able to perform well enough over the period of time. Any potential reasons that could slow the system down? Prevent application errors. Enhance your customer experience, from the beginning on Mobile Devices with our proven Mobile Testing Process. Online bookings. Mapping. Takeout. Parking. Attending class. Trading. Connections. Financial transactions. Have you used your mobile device for any of these purposes? Do you have a mobile presence that enables your customers to do the same? If your site is not mobile enabled, then your site will not function well for your potential customers. Mobile devices such as Smartphone, iPhone, iPad, Galaxy Note, etc. With a robust mobile experience solution that has been thoroughly tested, you can achieve higher customer retention rates and satisfaction ratings. Our company works with compliance to guidelines and standards and we want to meet your needs in a timely manner. Let us provide you with free consultation to make sure you select best mobile testing process and tool for your mobile testing needs. Let’s connect! Want to protect yourself and your company? Let’s talk. As smartphones become the dominant way for businesspeople to connect, applications which began as novelties are becoming recognized as business tools. However, they can only be considered as business solutions once their usability and performances are thoroughly tested. Otherwise, there may be risks in using mobile applications. WHY DO THESE APPLICATIONS FAILS? In a few short years, smartphone apps have driven development competition to new heights. At Software QA Service, we understand that you want to be part of that competition. Remember that it is only through automobile testing that you can ensure the success of developing and launching an app. The primary role of mobile automation is to test a developed application’s performance, which ensures its usefulness and viability once released. Our testing process includes the evaluation of the overall application and functionalities across a range of platforms and devices. As a result, user experience is enhanced. What makes this testing process important now? As we know, more people are using mobile handsets than computers and laptops. The availability of mobile applications impacts a buyer’s decision to purchase such products. Mobile automation is a quick and cost-effective testing process that allows you to launch apps more successfully. It is better to for us to test the app than to let the customers do it! Our proprietary testing process involves using your developed app on real devices to guarantee excellent functions. We analyze the mobile’s bandwidth and hardware requirements and validate the best response times in a range of circumstances and levels. It is also part of our process to ensure that every application we test is thoroughly scanned. HOW OUR TEST TEAMS HELPS YOU AVOID MOBILE APP FAILURE? Our team of experienced professionals with combined knowledge of more than 15 plus years in mobile automation are highly knowledgeable on the latest mobile automation testing technologies. We have successfully developed custom Mobile Automation frameworks for our clients. These frameworks are extensively used on Windows, iOS & Android devices. We can handle complex issues related to Android Studio, UberTester, Appium, Testdroid, etc. Regardless of fast paced changes taking place in the mobile automation market, our team remains capable of delivering all qualities that are important in early testing through the application development process. These include selection of tools type, competition, security and privacy concerns, recurrent upload, fast updates and many more. Our Test Teams can handle a range of mobile automation testing types, including regression, security, functional, usability, compatibility, load and performance testing. Our process makes use of the industry’s best practices to save you time and money. Aside from our primary mobile automation testing service, we also give you access to our free 50-minute consultation. Contact us now and save your time and energies you spent on your mobile application development and for a better mobile automation testing process! 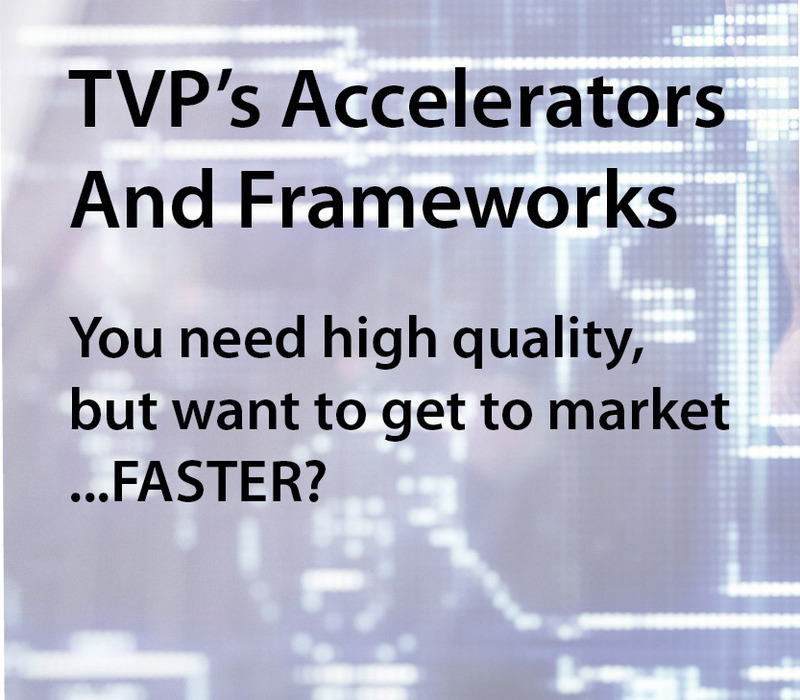 Want to accelerate faster to market? Let’s talk. Software Testing is about testing a feature with varying test data to get a result and then comparing the actual result with expected result. Customer mistrust. Revenue loss. Missed deadlines and high severity due to critical bugs that went unnoticed until after “Go Live”. These are just a few of the consequences that could arise from your application being tested by well-intentioned, but unfocused, budget strapped QA professionals. Will you need to roll back after your early adopter customers have uncovered bugs for you? How can you protect yourself and your customers from these adverse scenarios? By placing your trust in our state of the art testing systems. Manual testing is a comprehensive process implemented through manually finding defects without using automation or tools scripting. Our experts read line by line through your script, meticulously rooting out the issues that automated tools may not find. This testing can quickly detect major errors from your application, leaving you more time to do what you do best, solve your customers’ problems. 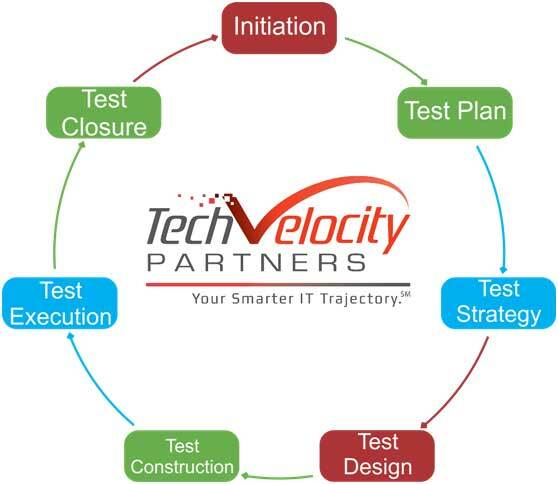 WHY SOFTWARE TESTING SERVICES FROM TECH VELOCITY? With our combined expertise and knowledge backed with innovation, we are fully focused on our clients’ needs and problems. We will absolutely help you meet your application’s goals. We are ruthless. We will pursue your quality issues and will make sure you receive the highest value for our program with you, Plus, we offer an iron-clad, unbeatable 100% satisfaction guarantee. When we partner with you to perform your manual testing project, you are guaranteed prompt, reliable, and competitively priced service. Unlike our competitors’ services, we offer our proprietary testing platform that is configurable to your project’s exact needs. We will work within your set priorities, placing your needs first. Contact us today for a brief risk analysis to ensure that your system is not putting your company and your clients at risk. Want to improve the test coverage? Let’s talk. We are raising the bar on testing production and speed while delivering higher quality applications at a lower cost. Test automation helps reduce manual testing and accelerates regression testing. When it comes to effective testing, there is no room for error. At TVP, we don’t mess around with testing. We offer a robust set of intelligent tools and assets. We achieve results by using standardized test scripts, best practices, and scripted automated testing tools, detecting defects early in the development lifecycle. We provide comprehensive automation testing capabilities for multi-platform applications, including regression testing, integration testing, performance, and scalability testing. Using our broad industry expertise, we will bring you an industrialized, easy to-adapt solution for your testing activities. Your IT projects will gain more transparency and manageability. We go one step ahead to drive high quality across your entire application lifecycle. Ready to transform your testing practices? We offer customized solution that fits you the best. Our engineering consultants will examine the maturity of your organization’s QA function and assist you in enhancing the cost efficient and time sensitive QA efforts. Need Automation testing expert’s advice? Let’s connect! …..
Technology has advanced exponentially in recent years and will continue to do so. With the demand to keep up with the latest innovations, software developers face the strain of intense competition. They must balance the pressure of meeting delivery schedules with the risk of producing compromised quality products, which leads to lost revenue and dissatisfied customers. The perfect solution for these issues is automation testing. This testing effectively reduces the extra time needed in marketing the product and cutting the testing budget. Investing in automation testing is a good solution to avoid any of the possible risks associated in developing software application and technology. Every software application needs an internal assessment before it is released. These assessments evaluate the product based on a wide range of parameters. Automation testing is faster and less risky than manual testing when it comes to errors. Test results are provided through the combination of entered data and comparison of the actual and expected results. However, one test is not enough. Continuous testing is necessary to guarantee superior quality. This ensures on-time delivery and customer satisfaction without compromising software quality. Every technology and software application developed today is expected to deliver speed, agility and quick response regardless of the industry in which it will be used. Delivering these is the primary benefit of using automation testing. This is also the key to improving delivery schedules, cutting costs and enhancing customer experience. But before the delivery of these qualities can be achieved, there are certain issues that need to be answered: which is the tool to be used, why is it the best fit for the client’s needs, what is the scope of automation, and many more. To answer these questions, we make our clients the most important part of our analytical process. As experts in the automation testing, it is our responsibility to know about your business and your products. We use that knowledge to design a custom testing solution that is specific to your needs. HOW WE HELP YOU AVOID FUTURE ISSUES AND RISKS THROUGH OUR TESTING SERVICE? Our team provides software testing services that suit the client’s enterprise needs. We have a team of knowledgeable professionals with combined knowledge of more than 50 years of experience with using today’s latest tools and technologies, which translates to a highly efficient testing process. Our experts use both proven solutions and innovative tools that can be adapted to match your testing needs. open source technologies such as Behave, Selenium, Appium, Galen, Cucumber, and Fitnesse. Number of clients have partnered with us to assist with their mobile automation, mobile testing, security and performance testing efforts using technologies such as: QTP, QC, LoadRunner, JMeter, Neoload, GreenHat and Open Source Tools like Selenium RC & Webdriver with Java, .Net, Python, Ruby, PHP, JMeter, SoapUI, TestNG, Jenkins, ReportNG, JUnit, Cucumber & Capybara, Tosca, Perfecto and OWASP Security tools. Want to fully ensure the application accuracy? Let’s talk. Psssst! If you like, we’ll provide a testing consultation, and provide valuable guidance in that meeting… on a comp basis, no obligation. We love sharing our expertise. 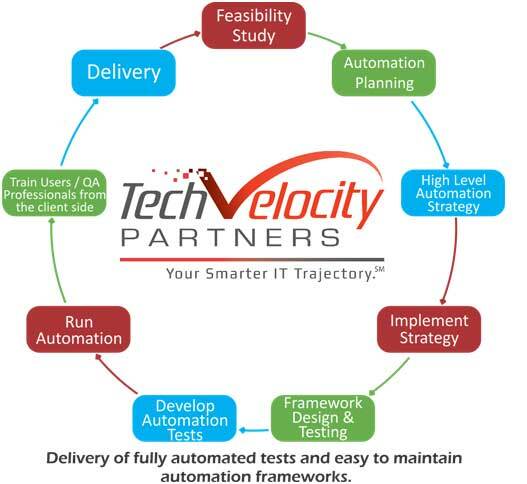 The TechVelocity Partners team has systematically planned and invested in building strong, extensible and customizable automation frameworks with a suite of ready test cases to start sooner…work faster…and accelerate your time-to-market. We have developed a built in technology-agnostic and modular approach, for these accelerators and frameworks. And they can be readily deployed for your projects and integrated with commercial and open source tools to deliver a faster launch time and ROI for your business. Please take a moment to FOLLOW us now, get the latest updates, and discover the new trajectory in IT Services!